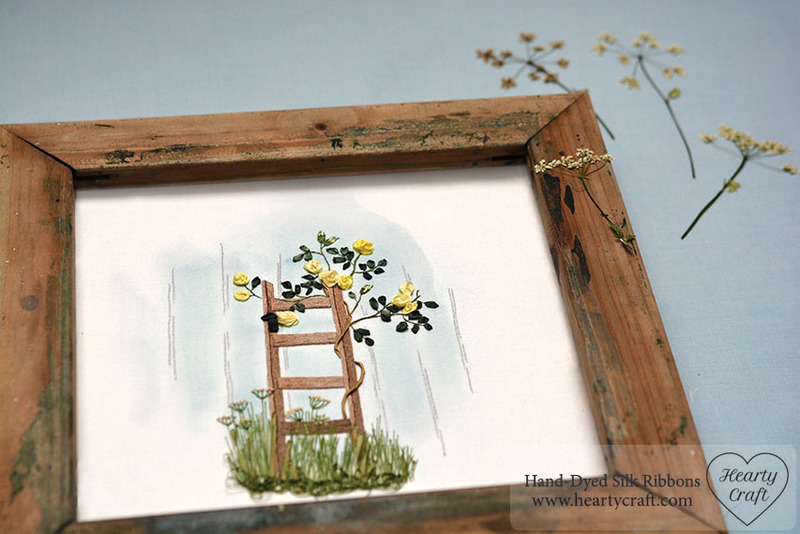 Whilst drawing up the design I thought ladders must be popular among gardeners. They are beautiful, especially vintage ones, and they look great supporting climbing plants. 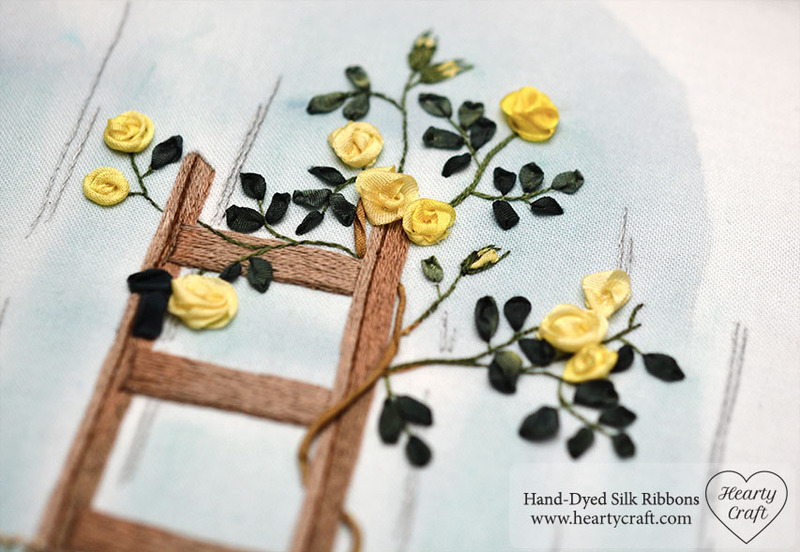 I used two yellow shades of 4mm wide silk ribbon to give the bush that uneven look when some flowers are bright and others have faded. As the ribbons are hand-dyed, all the flowers differ in colour slightly, and that makes them even more charming. They are ‘Yellow Sun’ and ‘Vanilla’ hand-dyed silk ribbons. 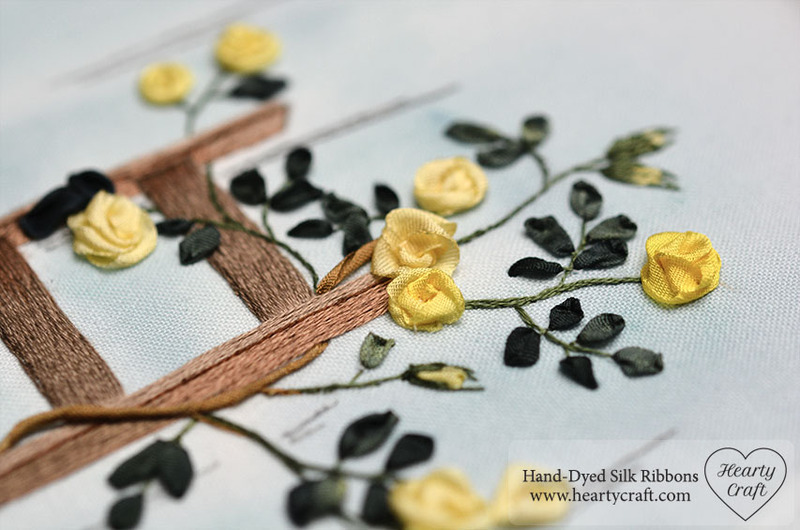 Leaves are worked with 4mm and 7mm wide ‘pine’ ribbons using ribbon stitch. I added cow parsley to make the garden look wild, but placed it neatly so it doesn’t look abandoned. 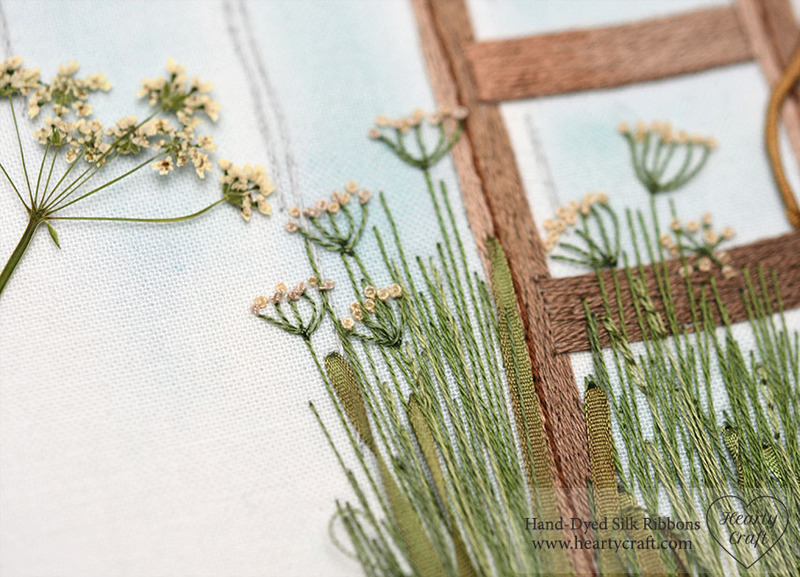 When stitching the grass I mixed straight stitches with embroidery floss and silk ribbon to make it more textured. The ribbon is 2mm wide ‘Lawn’. I haven’t framed the piece yet. The frame on the first photo is actually a leftover from some experiments with screen printing. It was used to stretch the mesh, and it is stained with photosensitive emulsion. However, I do like how the green spots match the embroidery, so I am seriously considering of finishing the piece in it. I love this.. simple but effective… but how have you done your roses? Are they made up first and then stitched on or stitched in situ.. I have tried and tried to get them like this. It is beautiful. Thank you for your comment. It’s hard to explain how to make the roses without photos. You need to twist a ribbon before taking a needle to a backside. Look for twisted ribbon roses tutorials, there are plenty of them on the Internet. These roses is so much fun to stitch. Love these roses – very inspirational.